The rickety ferry from the Gambia’s capital, Banjul, to Barra, the gateway to Senegal, is Africa in all its clatter and colour, writes Estella Shardlow. The air smelled of salt; a mixture of sea spray and sweat. 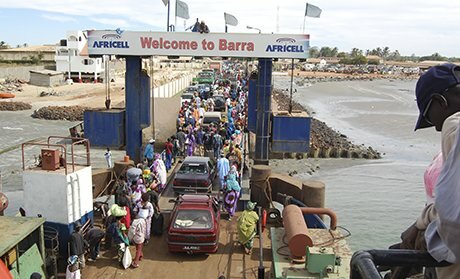 The occasional tang of petrol rose from the engine, which gurgled and moaned as it hauled the overloaded ferry from Banjul to Barra. With every bone-juddering vibration I tried to banish thoughts of the possible state of the machinery hidden beneath its rusting hull. The vehicles and bodies jammed on deck made an eye-wateringly bright jigsaw. Clothes clashed like sweet wrappers, batik headdresses vying with Nike stripes. People were sitting on top of minibuses, hanging out of car windows, clinging onto ladders and wedged in all the crazy-paving gaps in between. Men in embroidered agbada and skullcaps, on their way to business meetings in Dakar, stowed briefcases between their knees. A Lebanese couple sat in air-conditioned solitude in a white SUV. A balloon-stomached cow stood sandwiched between two jeeps – she seemed to be travelling solo, and nonchalantly chewed a newspaper poking out of someone’s luggage. The Gambia may have a gleaming modern airport and tarmac highways, but still the only way to travel between the capital, Banju,l and Barra – gateway town to the country’s north and, beyond that, to Senegal – is this one ferry, chugging back and forth where the Gambia river is swallowed by the Atlantic. Frequent engine failures leave passengers stranded mid-crossing, so a fleet of flimsy canoes is doing a roaring trade. Only yesterday one split open, and seven drowned. The sun eyeballed us. Its light caught the surface of the water like scattered coins. On the opposite shore, merely a thin strip of purple for now, taxis waited in the dust. Tinny reggae rattled from a portable stereo balanced on someone’s lap, but beneath the metallic gurgle of the engine and cacophonous chatter, the lyrics were lost. Achingly slowly, the north shore grew larger. I began to pick out the forms of palm trees and moored fishing boats. My legs stiffened but there was nowhere to stretch. A young girl crouched right at my feet and I could see the cobweb pattern of her braids, oiled and intricately twisted across her scalp. Her pink T-shirt had pale creases where the sun had bleached it. Then I could read the names painted on the sides of boats and see the palms’ fringed edges. The deck began to seethe and hum as passengers prepared to disembark. We butted the wooden harbour – once, twice, three times – and boys scrambled on to the shore with ropes to secure us. Two guards uniformed in khaki hauled the barrier open and the boat emptied like water gushing from a bottle. The deck’s permanent litter was revealed: python-like coils of rope, battered orange lifebuoys and rust-marbled oil drums. As we clattered down the ramp a new crowd waited, armed with the same journey paraphernalia – cages of chickens, battered suitcases, a plastic-wrapped fridge, and fabric bundles slung across bodies, or balancing on heads. They know the crossing is a lottery, but life dictates they keep making it. Is it possible to have your email contact?